The Florida Panthers have traded left winger Sean Bergenheim and a 2016 seventh-round draft pick to the Minnesota Wild in exchange for a 2016 third-round selection. 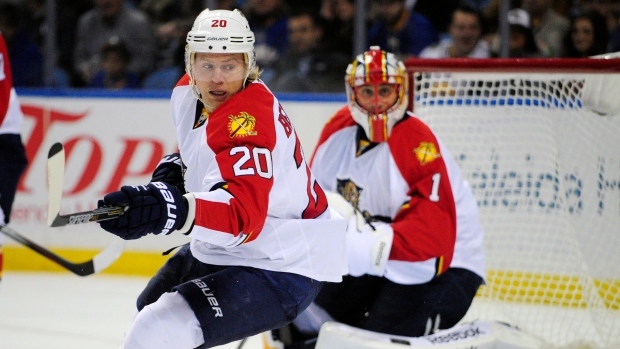 The 31-year-old Finn has scored eight goals and 10 assists in 39 games with the Panthers this season. Bergenheim is in the final year of a four-year deal he signed prior to the 2011-12 season worth an average annual value of $2.75 million. Florida retained no salary in the deal. The Wild had to use their 2016 third rounder because this year's third was used on Devan Dubnyk. Originally selected 22nd overall by the New York Islanders at the 2002 NHL Entry Draft, Bergenheim has appeared in 489 career NHL games with the Islanders, Panthers and Tampa Bay Lightning, scoring 95 goals and 84 assists. He has represented Finland internationally on numerous occasions, winning two bronze and one silver at the IIHF World Championships between 2006 and 2008 and three straight bronze medals at the World Junior Championships between 2002 and 2004.